I am aware that some people have received a new ‘final, final, final, last, last, final’ notice. Of note, now they are REALLY trying to get you out of you owning your meter. Remember, possession is 9/10ths of the law… and they want that meter. That meter is their ‘gateway’ to the data, to getting you into whichever program they want now or later etc. Either by outright taking it off your house, or REGIStering or ‘Enrolling’ you into some program. Think about it, they want it so bad that they are trying to say to you ‘There is a blue tag on your meter, this has nothing to do with how the meter works, in fact it has really no bearing on anything at all. ‘But that blue thing, it has expired. Why? Well, because we say it did. You are in danger and so are we, so much so to the point that we are willing to get you out of that ‘danger’ by taking a meter off someones house the next town over and bringing it and putting it on your house. There is good news, this meter will be much older than your existing meter but this one will not be expired. This is BC Hydro right now in a nutshell. Why? because they want you to take a ‘new analogue’ because that ‘new’ meter from 1973 will have a different number on it altogether. Which is great for them, because they can put a new number of meter on your bill and change your account altogether with the added benefit that this ‘new’ meter will have its number inputted into the program of those that ‘ENROLLED’ into the Meter Choices Program. ALL meters supplied by that program will be, of course, owned by? BC Hydro. Remember, they want you REGIStered in everything. In order to try and take ownership of that meter…they are resorting to scare tactics. This is what ‘transparent bullying’ is. This was the whole purpose of the ‘Meter Choices Program’ (MCP)was to eventually and over time, make means by which to assume (amalgamate) ownership of your meter. They like to call it ‘choices’ but it was never intended to be a choice but a ‘slow burn’ into a predetermined outcome. Up to and including giving you a ‘new’ analogue that has been REGIStered as part of the MCP! Think about that. They are so desperate that they are WILLING to take perfectly good paying customers, some who have never missed a payment in DECADES and cut them off! Have you ever heard of a business model that works like that? Nope… but leave it to government and BC Hydro to be the first. What is making them desperate? Control and ownership of the meter! Now do you get why we did a CLAIM OF RIGHT to the meter? I wish I was making this up and I also wish I was not living in a Province where this is ACTUALLY happening… right now. You are witnessing first hand how desperate and ridiculous they are, they should be ashamed of themselves… but remember, they don’t care about anything but money. You could also, if this makes your more comfortable, send the rebut back noting that ‘You do not consent to be enrolled in any program and the change out of the meter is NOT your consent to be enrolled but is being done under duress of an essential life service being cut off under threat” VOID the document etc. as before. In the end, this is a personal decision on how you want to proceed, not everyone is going to be of the same comfort level, and this is an important distinction. Some do not care and want to get cut off and go off grid. (And yes, many are and this option might be something to look at) Some may accept a ‘new analogue’ some may not even Rebut and have nothing happen, some may rebut and have their power cut. Some will rebut and may get virtually the same notice in a couple weeks. We cannot predict the future nor the actions of what is basically a criminal for profit enterprise. Note: Words in ALL CAPS are not for ‘shouting’ purposes, but to help you see what things are ‘FICTIONS’ etc. as laid out below. Some have thought that these latest notices might be because of the Class Action Lawsuit and them being worried about that. Firstly, I want to stress again that this site has ZERO involvement with that lawsuit and have not from the beginning. Do I wish that they get to a place to have all meters removed and analogues put back on? ABSOLUTELY, then we can go back to our ‘normal’ life! This is part of why lawsuits of this type are in an uphill battle. Everyone can do simple and easy research on the matters below. In fact, this is preferred so you can self educate and come to your own conclusions. Many of the words you will see can easily be found online. It is that now, we think after all this time, you are beginning to (or already have) started to see how this whole game (magic show) works. Our documents are very clear. To have ownership of the meter. Some of the plaintiffs in the lawsuit REGISTERED their meters (voluntarily no less) with the Crown. If you can recall from past posts or other means by which you learned this… REGIStering your anything (like a meter) makes it the CROWN/QUEEN’S property. Not good. See below example document. This is why BC Hydro wanted you to REGISter for the Meter Choices Program as it is very clear in Law/Legal that REGIStering for anything gives that which is REGIStered to a massive amount of power over whoever REGIStered their item, house, car, meter… whatever. 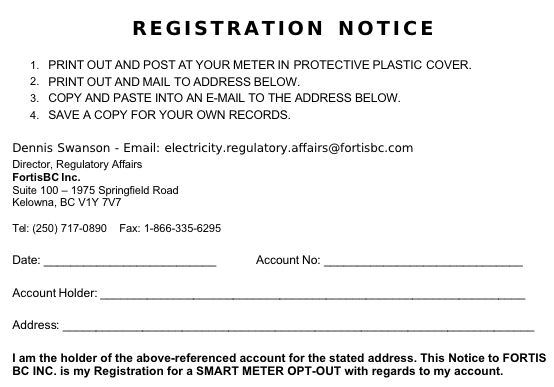 See below, this is from sites that are promoting BOTH BC Hydro and Fortis CUSTOMERS to REGISter their accounts? Why? Who benefits from this? REGIS is the root word of what give the QUEEN title over whatever is REGIStered. Knowing what you know… does the above document make any sense to do or have any purpose to it other than to voluntarily REGISter your meter, admit/consent/contract to being the ACCOUNT (and not you) and become the very PERSON BC Hydro and the CROWN would prefer you to be? Hmmmmm….. They were also voluntarily REGIStering the ACCOUNT and that they are a CUSTOMER. YOU, if you did the COR / NOD documents (and hopefully read them) are NOT the ACCOUNT, CUSTOMER and most certainly would never have REGIStered your meter with the very agency that is trying to take ownership of it. Because you know that OWNING the meter is the goal of BC Hydro… and thus, this should be your goal too. REGIStering the meter benefits one party only… the CROWN! YOU are a private owner on private property which is a big difference from being an ACCOUNT HOLDER or CUSTOMER or PERSON. The ‘CLASS ACTION’ is? a CLASS OF PERSONS. and they are CUSTOMERS and ACCOUNT HOLDERS. When you are a PERSON, you are a fiction. You do not exist. You are a piece of paper, or, in effect, what is ‘representing’ you is that piece of paper. Can radiation harm a piece of paper? Nope. Does a piece of paper that gave it’s consent to be spied on have rights not to be spied on? Nope. There are more little gems of giving them jurisdiction/ownership and powers all over other acts but this part is the most easily understood and digestible. This is from Section 12, but good if you read the whole thing for sure! Yes, this means if you are the PERSON (as in CLASS OF PERSONS) they are deeming you have NO RIGHTS ‘despite the Land Title Act’ so who, if you are a PERSON…. OWNS YOUR PROPERTY? BC HYDRO! See how they LOVE that word REGISTRATION, REGISTERED and PERSON? Now think, where else are you seeing this word so often used and often ‘advised’ to be used? Do you think it makes sense to become all that Hydro wants you to be and expect results? Especially if admitting/consenting/accepting you are those things gives BC HYDRO ALL POWER over your ENTIRE PROPERTY INCLUDING YOUR METER? That’s up to you to decide. As in the PERSON is just a CORPORATION (that name on the top of the Notices DAVID T. RICHARDS) and ‘legally’ that is correct because in law a PERSON IS A CORPORATION. That is one of the means by which BC Hydro and the CROWN will assume ownership of that title, name at the top of your bill that is ‘you’ in their eyes and is the CORPORATION they are ‘amalgamating’ into itself. When someone walks into court… they are NOT talking to the ‘Human’ standing there, they are talking to the PERSON, the DOCUMENT, the NAME at the top of the NOTICES and the NAME that is for billing to the ACCOUNT and CUSTOMER that you (unless you have done the COR/NOD) have consented to being known as, addressed as etc. That is why they will ask ‘Are you JOHN Q. PLAINTIFF’ or ‘Are you JOHN Q. DEFENDANT’ and when the PERSON answers ‘Yes’ thinking they are talking to ‘them’ they are really admitting they are that PERSON, granting the CROWN jurisdiction and consenting to all that the CROWN deems appropriate (like taking the meter) and ‘being bound’ by the ACTS and LAWS the CROWN governs them by. You can look at nearly all meter lawsuits and this is what they say nearly every time. If you give them jurisdiction over you, then the ACTS apply to you and what is said in the ACTS or what is ‘approved’ by the ‘appropriate regulatory body’ stands, because you have consented to being ‘owned’ (jurisdiction) by that party (the CROWN) which makes??? The ACTS! And how are you the fiction? By being a CUSTOMER, INDIVIDUAL, RESIDENT, ACCOUNT HOLDER… all of which are used all over the language of the lawsuit. ‘SUBJECT PROPERTY’ is also used… and what are you if you say you are a subject? A ‘sub’ject of the QUEEN, who is the CROWN, who is pushing the smart meters on you. ‘There are only two “persons” in law, a human being, and everything else: A natural-person is a legal entity for the human-being. ‘For the Human Being‘ as in, the FICTIONAL PERSON represents the ‘real thing!’ If your ‘representative’ is a piece of paper… it cannot be harmed by Radiation, has no Privacy etc. Now, what do you think DAVID T. RICHARDS IS? (IF you guessed an ARTIFICIAL PERSON) you are correct. Do you think this was just some ‘careless accident’ Nope, the ACCOUNT is the ARTIFICIAL PERSON. the CUSTOMER is the ARTIFICIAL PERSON… the PERSON is the ARTIFICIAL PERSON! The fiction that cannot be harmed… because it ‘does not exist’ Can you see how this works? It is right in front of you…! So why would you ‘consent’ to be a ‘non human entity’ and still think that you will have ‘rights’? PERSON, RESIDENT (of the corporation that is BRITISH COLUMBIA that is owned by the CROWN) and even an INDIVIDUAL on top of contracting/consenting you are the PERSON, the non human being/entity that somehow can be harmed? What we are not big fans of is that this CLASS OF PERSONS lawsuits purpose is to ‘represent ALL CUSTOMERS’ of BC Hydro. So whether you like it or not, on your behalf (and without your consent) YOU are going to be lumped into that group of PERSONS and CUSTOMERS (that are owned by BC Hydro) and will be subject to the verdicts/rulings handed down by the very CROWN that is pushing the meters. In reading the above, it may give you some understanding as to why and how all those words magically and so perfectly got into the paperwork for the lawsuit itself. ‘FIRST DUTY IS TO THE PUBLIC’ and remember, the PUBLIC is the CROWN, and that is why you are the PRIVATE owner, not a RESIDENT, ACCOUNT HOLDER, CUSTOMER, INDIVIDUAL because these are all terms used to put you under control of the CROWN. Or it will say ‘SUBJECT PROPERTY’ who is the SUBJECT? and what is a ‘SUBJECT’ well, the SUBJECT is the QUEENS property… so why would you want to ‘own’ a SUBJECT PROPERTY? You wouldn’t, that is why you want to be a Private Owner! So, if you give consent to be owned, and it is the CROWN that owns everything and it is the very CROWN you are asking for your rights from (which you don’t have because you have given them all away) the simple question becomes… how is it possible to win? SEE THIS PDF for clarity. Staying on the very basic side. You buy a car outright, you get caught going very fast, this is not your first time, and they want to take your car and impound it. But it is not their car, because you own it and have paid for it free and clear. Well, you don’t own it. Why? Because you REGIStered it… this makes it the QUEEN’S property. That is just how it works. No one is saying to speed or not register your car if you want. What is being said is that is the mechanism by which they take ownership of the car plain and simple. Even look at your drivers license. It has RICHARDS, then below DAVID TOM your picture and your signature (on your throat no less) and what is the purpose of that? Your signature makes ‘you the human’ bound that ‘entity’ that you agreed to become…. the??? PERSON! Go on, look in your wallet and see what is happening for the first time. So, knowing this, would you REGISter your meter, account and become a customer? Of course you wouldn’t. Would it make sense to follow that ‘advice’? You can be the judge of that ‘advice’ and who benefits from it. So effectively, if they are ruled against by the CROWN they have consented to be owned by who just so happens to be the same CROWN pushing the meters, so long as you are a CUSTOMER… you get that ruling that, from reading the above, right or wrong has low odds of being in your (or those that wish to stay a CUSTOMER/PERSON) favour. The Guess is that it will be allowed to proceed and then ruled against on some grounds that does not reveal the real reason being ALL of the PERSONS in the lawsuit agreed to be amalgamated and SUBJECTS to ‘any and all acts’ related to that act. Which of course means? The Utility Commission Act, the Electrical Tariff Act, the Clean Energy Act and so on. Remember those running the suit said that ‘we (you) are BOUND by those Acts’ so if this is the case… does it make sense to become part of the mechanisms to be bound by those Acts? You can figure that out. As said, of course we hope those people in this Class Action win, my life would be much better if it did happen that way. But the above was meant to point out to you the potentials of how things will happen and how the courts are likely to perceive this matter in the end. Jurisdiction and ownership, in a commercial environment (the CROWN’S COURT) and if they own the METER, the PROPERTY and the PERSON the odds are very low, they are going to rule against themselves in this matter. And the odds are very high, if in the end they rule against the CLASS OF PERSONS they are not going to come out and say how they reached that conclusion, just say something about ‘Safety code 6 is the standard and the meters fall under the guidelines of the standard’ and be done with it. We will be releasing more on ‘Acts’ in the coming months and more on understanding the above and how you DO NOT want to get lumped in with all the other PERSONS, CUSTOMERS, ACCOUNT HOLDERS out there. Hope you enjoyed and this helped, thanks! Next Next post: Fires, Forensics, Facts, Figures, Finance and Fun!